Sprints, jumps, and agility work can work wonders for body composition. But to get maximum results from your high-intensity efforts, back them up with smart nutrition and supplementation. Here's how! Recently, I had the pleasure of appearing on the cover of the December 2014 issue of "Oxygen" magazine. I have a long history with this magazine, and I feel like it was largely responsible for my initial success in the fitness industry way back when. So, needless to say, this was an awesome experience that meant a lot to me, especially because I also contributed a workout to the issue. The workout I created was something I would do—and have done—myself. It's a high-intensity, full-body program inspired by my experience in collegiate athletics. I wanted to convey an important point: If you move your body in an athletic way, your results and physique will come. You don't need to tailor every workout to how you want to look; do the workout first, and let the body come naturally. Not only will you look great, you'll also be a better athlete. But there's another ingredient to this performance pastry: nutrition! And I'm not just talking about your overall nutritional strategy, or your—sigh—"diet." If you've ever made the mistake of eating like a bodybuilder on the same day you do a sprint or agility workout, you know that eating for performance can make the difference between feeling great and feeling beyond awful. Here's the new way to fuel up for high-intensity training. Weekend: Get out and enjoy yourself! High-intensity workouts require you to eat in a certain way. First and foremost, carbs are non-negotiable. They are the fuel for movement and speed, and you absolutely need them to perform at your peak. In fact, I didn't deplete or deny myself carbs at all for my cover or workout photo shoot. I do recommend timing your carbs, however. Ingest only complex, slow-digesting carbs in your morning and early afternoon meals, and taper them off around 3 or 4 p.m. After that, replace them with non-starchy vegetables. This will give you plenty of energy to play with, which is the real key to getting lean. 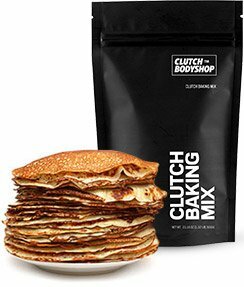 For breakfast I recommend slow-burning carbs like oatmeal paired with egg whites, or protein pancakes made with a scoop of Baking Mix from Clutch Bodyshop, an egg white, almond milk, and oatmeal. Later, consume that first meal at least an hour and a half before your workout. This is to give it time to be digested—and so there's no chance it comes back up! After your workout, proper nutrition is very important. Your body considers exercise a stressor, and you need to eat and drink back what you've just depleted from your system in order to kick-start your repair and recovery processes. Remember that strength and progress are not built during your workouts; they're built during your recovery. This is the perfect time to take in fast-digesting carbs, but that doesn't have to mean junk food. I like to drink 8 ounces of coconut water, straight up, at this time. At least a few times a week, I'll also toss my coconut water into the blender and make a homemade green juice. As the burning in your thighs after a few sets of sprints indicates, intense exercise creates an acidic environment in your body. This promotes inflammation, and green juice helps your body return to an alkaline state, which is better for repairing and rebuilding, and ultimately getting you results. Finally, I recommend a protein shake that is 100-percent whey isolate protein, mixed with water or almond milk. All of these things should be taken in immediately post-workout. It sounds like a lot of liquid, but you need those nutrients and water to initiate proper recovery. About an hour after training, have an actual meal. I personally love the Bodybuilding.com B-Elite meals for this particular meal. I'm very busy, so they are the perfect choice for me. I just pop one in the microwave and in five minutes or so I have clean chicken, brown rice, and broccoli in the perfect portions. For dinner, stick to protein and veggies. If I find myself hearing the call of my sweet tooth later on, I'll add in something I invented called "bread-free French toast." Basically, it's egg whites beaten with a little almond milk, some stevia, cinnamon and flax seed meal. Cook it up like you would an omelet with a side of veggies and it's like having French toast for dinner. Who could say no to that? My high-intensity workouts are inspired by competitive athletics, but I know that many people aren't performing them with the stadium in mind. No, they're thinking about the mirror, the bikini—in other words, dialing in their body composition. Strategic supplementation can definitely help you get maximum results out oft this type of training, while also helping you recover adequately between workouts. I recommend taking a stimulant-free pre-workout mixed with water right before you train. If you didn't know that such a thing existed, then you should definitely consider one. Here's the thing: Over time, the combination of stimulants and hard training exhausts your adrenal glands. This can lead to fat gain and leave you dragging through life. Good luck making it through my workouts then! Instead, I prefer caffeine-free pre-workouts that provide energy on a cellular level, such as the forthcoming Clutch Workout Powder, which will come out this December. I also recommend taking 1,000mg of BCAAs pre-workout to provide your body with immediate access to amino acids during training. Post-workout, I recommend 2,000 mg of glutamine with your protein shake, as well as another 1,000mg of BCAAs to saturate your system with the building blocks necessary to facilitate recovery and build muscle. If you're training with high intensity because you're aiming for a specific deadline, like I was for the "Oxygen" cover shoot, then consider adding in a fat-burner for a month, or if the deadline is shorter, a 21-day Clutch Cut. You may be surprised to hear me recommend a fat-burner, since they are often the primary suspects in adrenal fatigue. However, this is because people use them as an artificial source of energy. I only recommend stimulant-free fat-burners, like the Clutch Fat Burner, which promotes fat being burned as energy rather than just ramping up your heart rate. There's your plan. Now work hard, sprint fast, and watch everyone else try to keep up! I've trained celebrities like Bradley Cooper, Kate Hudson, and P. Diddy. My plan will help you get lean, mean, and cut beyond belief in only three weeks. Now that's clutch.